The demand for energy is expected to increase by 1.4% per year till 2040, with oil & natural gas contributing to approximately half the need. However, the global onshore oilfields are maturing and depleting, thereby, further increasing the gap between energy demand and supply. With the depletion of existing onshore oil and gas reserves, the oil & gas industry is witnessing an upward trend in the quest for deepwater oil and gas exploration & production (E&P) activities. Offshore exploration & production remains a complex operation, which requires cost-efficient subsea processing developments, especially for long step-outs, marginal and dispersed fields frequently located in deep and ultra-deep waters, which requires a failsafe power supply, and in massive quantities. With the offshore E&P activities moving farther offshore and deeper, the demand for subsea power grids is expected to increase significantly during the forecast period. Furthermore, the offshore wind farms deployment is gaining wide popularity across regions and is expected to register a high growth rate, during 2018-2023 (the forecast period). As traditional onshore reserves are depleting, offshore resources are expected to play a more significant role in securing the growing demand for oil and gas. The increasing interest in offshore resources is illustrated by the fact that over the past 20 years, the number of significant shelf discoveries has been higher than the number of significant onshore discoveries. As of 2016, the offshore oil & gas production accounted for approximately 30% of the global output, with about 27% of the offshore reserve below 300 meters, and is expected to increase deeper and farther. The Middle East and the European regions are expected to invest heavily in offshore development to counter their declining onshore reserves and maintain the global production share through offshore fields. The rising investment for the development of the offshore oil & gas reserves is expected to supplement the demand for subsea power grid system, during the forecast period. Despite facing constant stiff competition from the shale producers of the North American region in the midst of current ‘lower for lower’ crude prices, the Middle East & Africa region is expected to register increased offshore development activities. In July 2017, Saudi Aramco announced an investment of USD 300 billion in the oil & gas sector over the next decade, in a bid to counter its depleting onshore reserves and to maintain its leading position of the oil-producing nation. 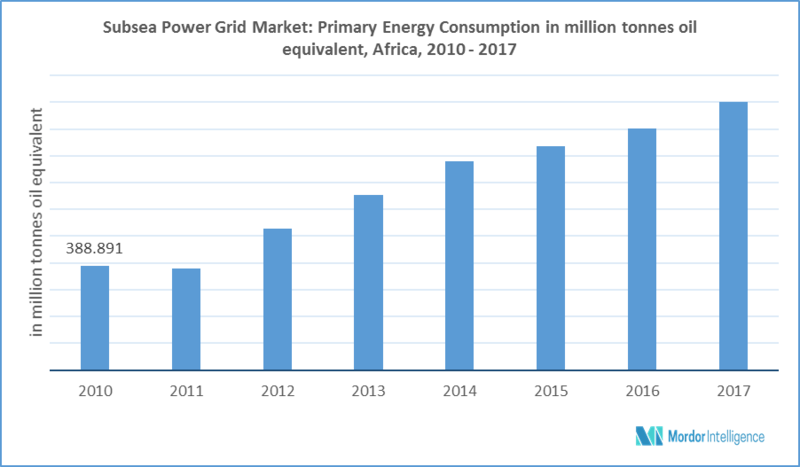 Similarly, Africa is also expected to witness high offshore E&P development activities during the forecast period, to fulfill its growing energy needs, which, in turn, would supplement the demand for subsea power grid system, to ensure constant power supply. In 2016, the Gulf of Mexico had set an annual crude oil production of 1.6 million barrels per day (b/d), surpassing the previous record established in 2009 by 44,000 b/d. The US oil & gas industry, buoyed by firm government support, is expected to further increase investment for the development of offshore oil & gas reserves. In 2017, the US government proposed one of the most sweeping offshore drilling plans in its history, by offering 90% of the entire US outer continental shelf, including the areas that have either never seen drilling or haven’t experience drilling, in a bid to be an energy superpower. The rising interest for offshore development in the United States is expected to supplement the subsea power grid market, during the forecast period. October 2017: Nexans has been selected by the EPC contractor Hyundai Heavy Industries (HHI) as the sole cable supplier for the second package for Nasr Phase II full field development project. August 2017: Eni Norge joins Siemens Subsea Power Grid Joint Industry Program (JIP). MAJOR PLAYERS: ABB Ltd, Siemens AG, Schneider Electric SE, General Electric Company, Nexans SA, Schlumberger Limited, Aker Solutions ASA, JDR Cable Systems Ltd, BPP Cables Ltd, and Parker-Hannifin Corp., among others.